Inarin Poropirtit – Anara Boazostobut in Sami – is situated 13 km from the village of Inari, on the road to Lemmenjoki and Kittilä. The location is both beautiful and peaceful. Owner in Inarin Poropirtit are Sami, and they continue the traditional livelihood of our family, reindeer herding. In addition, they earn part of our living from reindeer farm tourism. 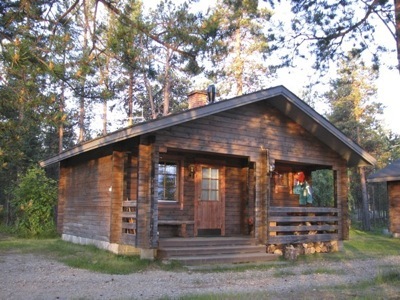 They have two log cabins with conveniences (6 persons each), one log cabin made from grey pinewood with a sauna on a river bang (4 persons) one wilderness cabinwith a sauna (4 persons) and one modernized house that used to be the home of a reindeerherding family. In summer, visitors can order motor boat trips, and, in winter, they arrange snowmobile excursions to the fell country or ice-fishing lakes or take our visitors to our reindeer herd. At their farm, they sell reindeer meat in many forms. In Summer, it can be nice to taste reindeer meat by cooking it on the grills that our cabins have. Visitors can also order local food made from reindeer meat and fish. The neighbourhood has good possibilities for hiking and fishing. The area is also a goot one for picking mushrooms and berries. The closest fell, Otsamo, is 7 km away.